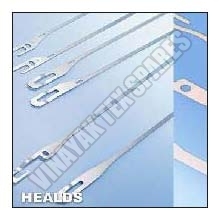 We are the known Manufacturer, Exporter and Supplier of Flat Steel Heald. The Flat Steel Heald is used in the weaving machinery of various textile industries. The Flat Steel Heald is manufacture by using high-grade material like steel, stainless steel, etc. The high quality Flat Steel Heald that we offer ensures accurate weaving and longer service life. These Flat Steel Healds are recognized by their end loops, which are in shapes of C, J and O.